I know, it seems that everyone has an excuse these days. I have been super busy lately. I have several projects that I am working on right now and several more going on in my head that I can't stop thinking about. But, I wanted to update our blog, for that one faithful reader we have out there. So, here is what has been going on with us up here in the middle of the midwest. Lately, we have had a few days of nice weather and the kids can’t get enough of playing outside. We started off the last month with a visit from family. We loved having everyone come and stay (even with a trip to the ER) and wish they could have stayed longer. As I’m sure you all know, C broke his arm. He fell when climbing into the van, and broke one of the bones in his forearm. He has already had two different casts on it, and they will put a short arm cast (one where he can bend his elbow) on later this week. The Dr. said he couldn’t play soccer this season. He was disappointed at first, but when he found out he could play T-Ball instead, he was thrilled. I guess we will have to see which one he likes better. K is playing soccer at the YMCA. She has had one practice and one game so far and has probably done more running than C did all last season. She is LOVING it! We went on a field trip for C's school last week to the local farm. C was in heaven with a new adventure. K thought she was part of the class and went along with all of the other kids. She will hopefully do well in preschool next year. E has finally started gaining some weight. He is 11 months old. It seems like just yesterday he was born. I know, is cliché, but true. He still is not quite sitting on his own and tends to crawl commando style. The Dr. was concerned with his trunk strength and referred him for Physical Therapy. We went for an evaluation and the PTherapist thought he would do really well with PT. So, we go every week to PT and he has been making a lot of progress in the last few weeks. She also has started putting Kenisiatape on his belly. It’s the same stuff that athletes use on injuries. So, he wears the tape from Tuesday to Saturday. It helps to train his trunk muscles to be in the right place. It has helped tremendously. He will now sit in the Bumbo for more than 2 minutes. He doesn’t like the grass too much, but loves the swing(outside). He has started getting really attached lately and really gets upset when Momma leaves the room. He still only has one tooth. Most kids get two at a time, but we are still waiting (going on 6 weeks now) for the second one. I have been staying really busy too. I have been doing a lot of reading lately. I have gotten our garden started and am excited to see what this summer will bring us. I also have a few projects in the works. I have started in the last few months making all of our bread. I also had my first adventure making jam (and its yummy). We are looking forward to warmer days and lots more time in the sunshine in the near future. So, I know its long, and if you are still reading by now, and not asleep, I promise I will try to post some pictures soon. For about 4 days, we had the opportunity to have Grandma, Aunt Tracie, and 5 additional kids staying with us for their Spring Break. What a blessing it is for us to have family that would take their Spring Break to come to visit us in Dayton, OH (not quite the dream destination). 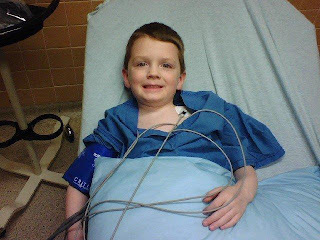 We started their visit off right with a trip to the mall and a 6 hour trip to the ER with a broken arm. This was followed by a long day at the Air Force Museum. I think we wore the younger kids out, but I think the older kids actually learned a thing or two (despite their best efforts not to "learn" during Spring Break). 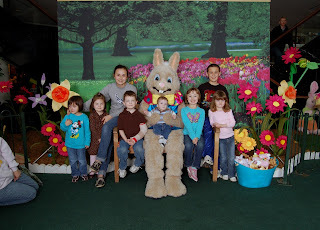 And that was followed by a trip to Build-a-Bear, a visit to the Easter Bunny, and some hanging out at home. Overall, the chaos of having 7 kids, 1 teenager, and 4 adults was overcome by the blessing of having family close by and the opportunity to spend quality time together. Thank you for your visit and thank you for loving us the way you do.